When Ruud Gullit was appointed player-manager at the West London club, after a season-long of highs and lows with Glenn Hoddle, the hubbub had not been one about the Dutchman’s credibility. It was the first managerial venture for the Ballon d’Or winner. A year back he’d joined the Blues on a free transfer to be appointed in Hoddle’s system the role of the sweeper, one he’s donned in his early days at PSV. The strategy saw two goalless draws in their first two fixtures and a 2-0 defeat at the hands of Middlesbrough, the first ever game at the Riverside Stadium. It wasn’t long before another star signing of the season, Mark Hughes struck home his first goal that came from a free kick against Coventry City. Chelsea took the lead first with an impetuous Dennis Wise penalty. However, this didn’t suffice for a win as the score remained 2-2 by the end of stoppage time. Gullit was too clever for his teammates, his debut against Everton had been a testament to the fact that he could get into tight areas and create chances only for his team to botch them. “It was like watching an 18-year-old play among 12-year-olds,” Hoddle reiterated. Ruud would get hold of the ball at the back and suavely slip it past opponents, occasionally posing as the reformed number 10. He brought with him the power-packed exuberance of Total Football and the agility of Italian panache. That didn’t cut it; enormous as he was with his outstanding technique on the ball, he wasn’t able to influence the players around him in a way that bore results. He was more than a sweeper at this point of time in his career. 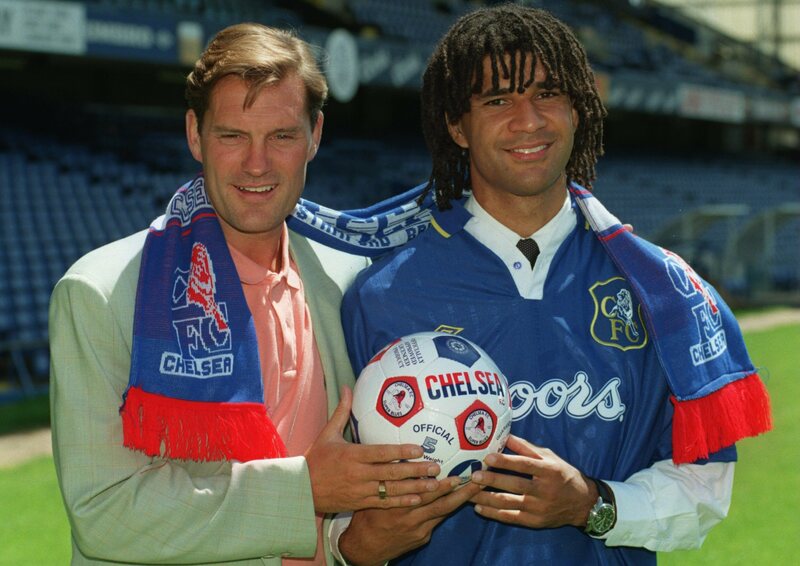 Eventually, such shortcomings led Hoddle to see the error of his ways wherein he incorporated Gullit in his familiar role of an attacking midfielder, alongside Nigel Spackman who played the conventional “van der Kerkhof”. He went on to score six goals in twenty-one appearances. The news of Hoddle leaving to take over the England job was no less than a punch to the gut for the home fans. No one had anticipated this especially after the club had just established themselves as a force to be reckoned with in all major cup competitions under his reign. Fortunately, chairman Ken Bates didn’t need to look far from his madding crowd; the fans had set their eyes on the new guy. Ruud Gullit was their diamond in the rough. In his book, How to Watch Soccer, he cited the Italian maestros Arrigo Sacchi, Fabio Capello, Dutch legend Rinus Michels and globe trotter Sven-Goran Eriksson as being his inspiration on this new path he forged his ideals unto. Even without a coaching license, he was granted enough freedom to exercise his caretaking, leadership and management. Out went English and Scotsmen alike, Paul Furlong, John Spencer and Gavin Peacock and in came world-renowned names like Frank Leboeuf, Gianluca Vialli and Roberto Di Matteo. Before the beginning of the new season, he relied heavily on his past experiences as a player, further deriving positives from matches against Ajax, a club whose philosophy he knew like the back of his hand. Gullit put to work the simple mantra of sticking to players who brought out the best in his squad, i.e. building an ideology around the team and not the reverse. He settled for a 4-4-2 diamond which he would switch to 5-3-2 regularly and stick with for the rest of the season. In 4-4-2, he believed you needed to get the ball to the striker as quickly as possible. A long ball would cut the opponents short so he’d advise Hughes to stay along the width of the 80-yard box in anticipation for these long balls. Vialli would be further down the pitch to accompany him. You needed a system which affirmed the players’ abilities and not one which demanded from them the quality and skill set they lacked to execute. A contrasting scenario when juxtaposed with the one we see at the club today. But to be fair to Sarri, Gullit had a lot of character in the 96-97 squad by then, even quality, all thanks to his international connections. He could easily see these characters applying themselves to this new paradigm, including the training sessions where Zola and co exercised absolute control of the ball and players. Now they had more than one person to lead them from the frontlines and that was faith worth having. Cut to November: going up against title holders, Manchester United at Old Trafford when the tragedy of Mathew Harding’s demise had hit them just weeks before. Losing a public figure who grew up loving the club and what it stood for is never easy, as is evident even today. Upon his appointment as the vice-chairman back in 1993, Matthew invested millions in the club player recruitment process but as fate would have it, didn’t live to see it come to fruition. Chelsea faced Tottenham Hotspur right after the helicopter accident and won the game 3 to 1, with goals from the man himself, The Black Tulip Gullit, Lee and Di Matteo. The match against United was a tad more special in its own way- with what looked like a composed Chelsea side infiltrating the United midfield like a knife through butter. A wonderful Dennis Wise corner in the first half saw centre-back Michael Duberry heading ball into the net, with the United goalkeeper and defender amok. Mark Hughes went on to act like the typical number 10, succeeding often in his hold up play to create individualistic chances for others that rendered the opponent’s defence futile. Gianluca Vialli comes to mind whenever you think about the star of that night. He’d beat Phil Neville in a run, picking the ball from a free kick and topple it over Schmeichel in what would be a sneaky clinching goal, making it 2-nil. Granted, United had their fair share of chances, with David Beckham bursting down unguarded wide half spaces to square over to Cantona who missed. Although Kevin Hitchcock, Chelsea goalkeeper, would be involved in one tremendous save of his own, United would get their breakthrough via May just under the 80th minute, yet the scoreline would remain further unchanged till the end. A mighty illustrious victory for the Blues it had been, strong-arming the defending champions who were caught off their guard beyond repair. 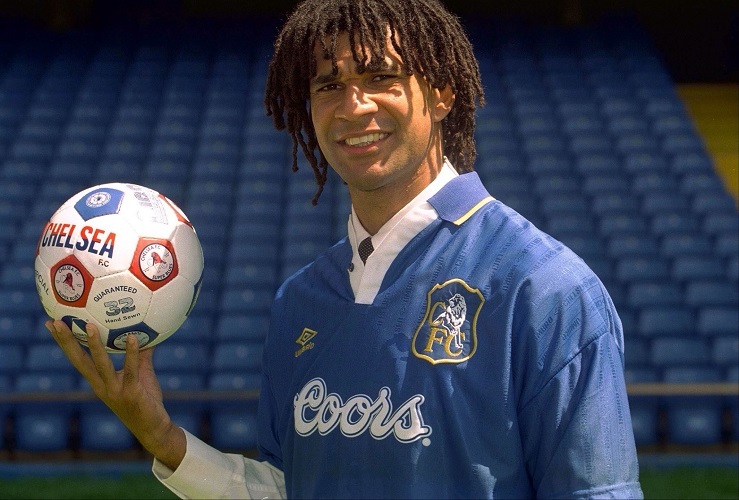 Whenever Gullit’s time at the club is mentioned, the talk of that FA cup run is widely held in high regards. Not only did Chelsea have one up over the Red Devils in the league, but they’d also beaten their fierce rivals Liverpool in the fourth round. To this day, it’s ranked as one of the most adrenalin fuelled matches the fans have ever witnessed in their lifetime at the home stadium. The Reds poached their first two strikes as quick as lightning, leaving the Chelsea defence dismantled within twenty minutes. Before world-class centre back Frank Lebeouf could gather his wits and anchor the Chelsea back line, they saw more opportunities arise which would have certainly seen Liverpool through to the next round had they been more clinical with their finishing. As the half time whistle blew, it was fate that entailed that all was not over. Mark Hughes reignited the fire as soon as he was substituted in the second half and scored with his powerful left foot. Italian Genie and forward, Gianfranco Zola, who arrived at the club in January, was now a crowd favourite. Nicknamed the Magic Box for a reason, a shaky pass from his first striker found him outside of the box and he went for a banger of a left-foot volley into the far left corner of the net. An absolute belter. He had levelled the score. The crowd lost it. Thousands at Stamford cheered at a tempo which resonated throughout the atmosphere. Vialli sealed the fate, later on, scoring a brace the Liverpool defence did not brace themselves for. It was done and dusted. Liverpool was finally conquered. Chelsea made it to the final with a convincing streak of performances against Leicester City, Portsmouth and Wimbledon in the cup tournament. Facing Middlesbrough wasn’t going to be as nerve-wracking as the year before, hardly if at all. They’d defeated them once already. But for a team facing relegation, Middlesbrough brought their own charisma and luck with them, contesting their first ever final. Di Matteo scored within the first 43 seconds of the game, beating Newcastle United legend Jackie Milburn’s previous record of 45 seconds. The second goal came from Petrescu’s cross which caught Zola mid-run, who nicked it just in time for Eddie Newton to find the net. Eddie scored the winner. Now desperate, Middlesbrough didn’t find the net or a clear cut chance to convert in the remaining time. It was over. History was finally made in a trophy distraught 26 years for Chelsea. Ruud Gullit’s men had clinched the FA Cup. The first ever Dutchman to have done it in the English Premier League. 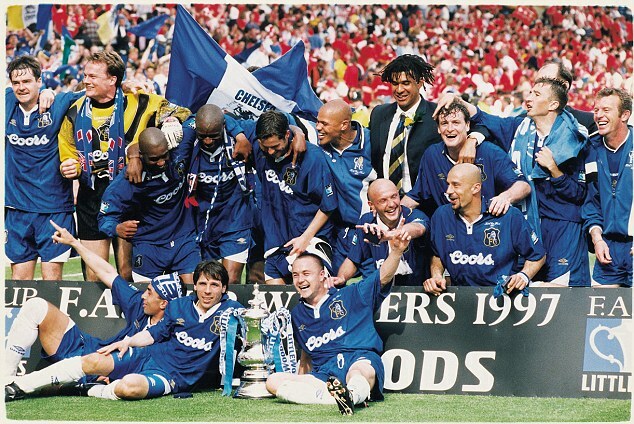 When Chelsea captain Dennis Wise strode up the stadium to collect the prestigious FA Cup, Gullit’s legacy, however short it might have been for one season, was forever cemented on it. It was the first glory the club’s tasted during the course of the league and more. It was also their best ever finish in the league at 6th. And it was just the beginning of a new chapter. They’d go on to win the European Cup Winners Cup next year without Ruud.